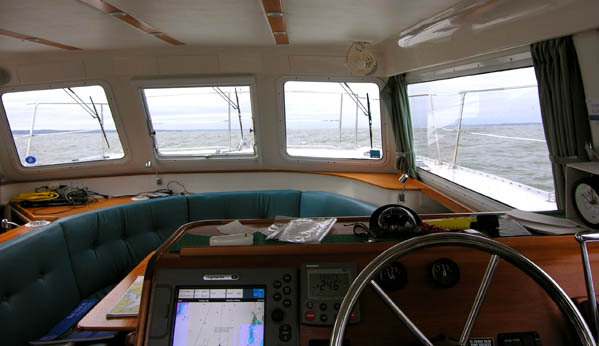 The last time I went down the ICW was over 20 years ago - in a sailboat with over 5-foot draft. This time around, it sure was a pleasure to zoom right by those poor guys (sailboats and deep-draft trawlers) as they searched anxiously for the center of the Ditch! 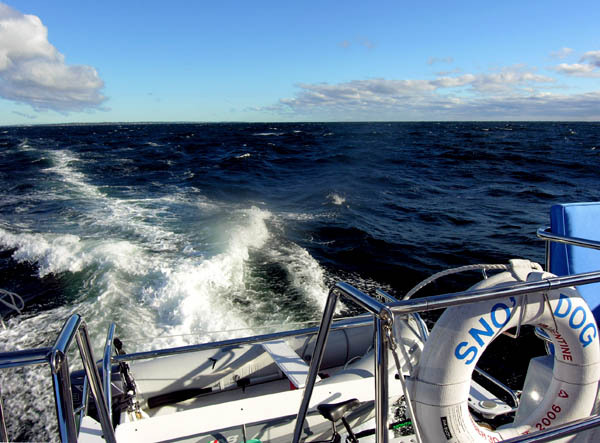 There's little doubt, Sno' Dog is the perfect boat for this trip. With all I've heard lately about the poor condition of the ICW, I was amazed how easy it all seemed in our PDQ. We had no problems whatsoever. We even did the notoriously shallow New Jersey ICW - just for the fun of it. Here again, we went right through without a hitch. It was great fun! My brother Kit & I took the boat from Portsmouth to Annapolis. 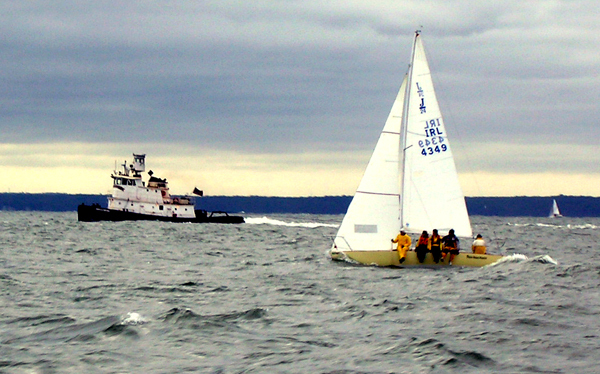 Without our wives aboard, we ran in some pretty rough weather. It was fun to see what the boat would do. 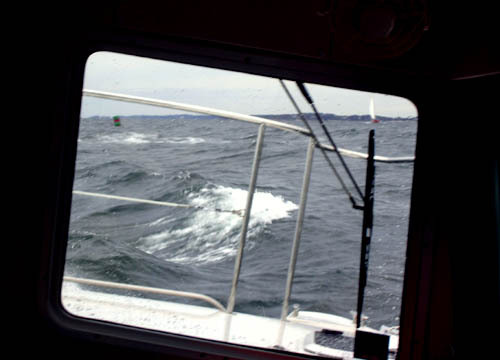 These photos were taken in Cape Cod Bay 15 miles off Boston with gale warnings in effect, the wind was gusting to 40 knots! 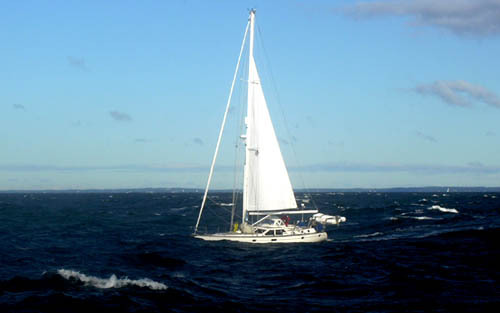 Strong winds and rough seas off the coast of Massachusetts; the boat handled it just fine - even running on autopilot! 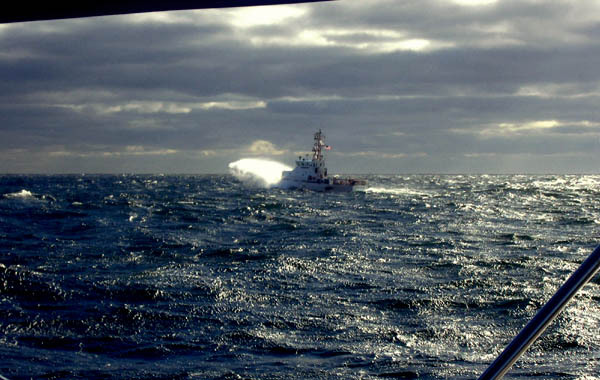 That's a 56-foot Coast Guard cutter blasting by. You can see there were some big waves out there. From Portsmouth, NH we cruised down the coast and through the Anisquam River to Gloucester. It was during our first night in Gloucester that a rip-roaring cold front came through with gale force winds - the wind lasted for the next three days. Despite the rough weather, we continued on to Newport, RI and then into the somewhat more protected waters of Long Island Sound. Our next overnight was at the friendly Milford Yacht Club in CT. Still pretty choppy as we pass Point Judith Lighthouse just south of Newport, RI. At this point, we were inside staying warm. I guess some folks really enjoy being "out there"! 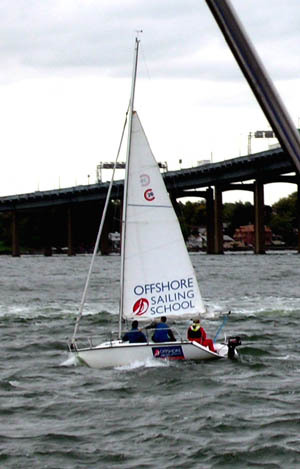 Learning the joys of rough-weather sailing with the Offshore Sailing School . 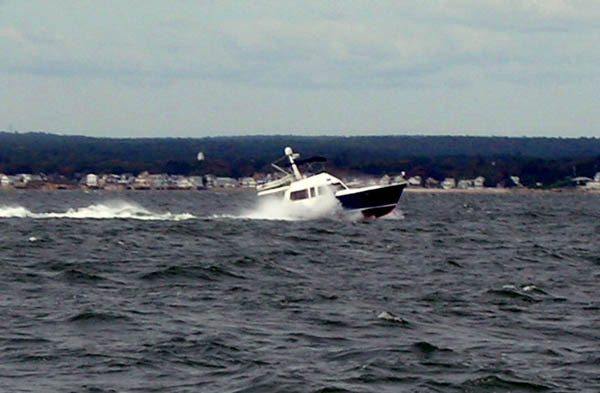 At this point, they were actually less than half a mile offshore in Long Island Sound near the Whitestone Bridge in NY. The civilized way to endure rough weather! We spent lots of time down here during the first three days of the trip. We used our cabin heat (which runs off engine coolant) a lot . We "sailed" past this boat as we neared the entrance to the Cape Cod Canal. It was an Oyster 52, I believe, a very seaworthy boat - and the only pleasure boat we saw on our passage from Gloucester to Newport on this blustery day.